Whether you are a beginner or advanced French speaker, you can now practice your French while touring Paris with our team of experienced bilingual French teachers. Select from the Paris neighborhoods, fashion, or chocolate and pastry tours. A fun and safe way to (re)visit the city of light with your own Parisian guide / French teacher. Even when you are surrounded by French-speaking people, it’s not always easy to get them to speak French to you (especially Parisians who tend to immediately answer in English)… Speaking French can be intimidating, especially for a beginner or intermediate student. Furthermore, a tourist traveling alone doesn’t always feel safe in a large city such as Paris. Now, you can enjoy Paris and rely on a dedicated teacher to take you to the most interesting places and help you practice your French. Our teachers are French native, speak English very well and are experienced French teachers. They have a passion for teaching and sharing their love of Paris. The French conversation tours are organized around themes: your teacher will provide useful French vocabulary, expressions, and if needed a small grammatical review to help you feel confident with the subject. Here are some examples of tours offered. However, we are quite flexible and so if you have a particular interest, don’t hesitate to ask! 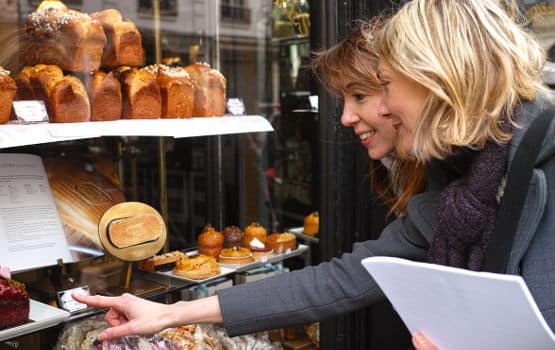 Embark upon a tour during which you will discover the nicest gourmet shops of the neighbourhood of Saint-Germain-des Près. Your private teacher will introduce you the gourmet food culture in France, and you’ll also stop for a well-deserved rest and enjoy a tasting of either a selection of cheese with a glass of wine, or if you are a sweet tooth, an amazing pastry in an exquisite “salon de thé”. The teacher will tailor the tour to your interest: exclusive chocolate, pastry or French cheese tours are available, or you can choose a tour with a little bit of all of the above! A pre-intermediate level (A2) minimum is required for this tours. Practice your French with your dedicated French teacher while visiting one of Paris’ neighborhood. Here is a selection – but suggestions are always welcomed! Mythical Paris: The Saint-Germain-des-Prés district of Paris’ artists. Discover the fascinating sculptures and the creative universe of Rodin in French. 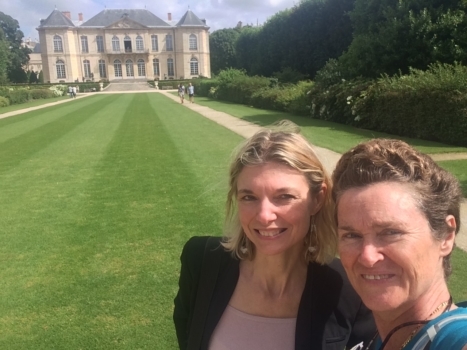 This private visit of the Rodin Museum with your dedicated French tutor will be in French, taking into account your current level of French. A pre-intermediate level (A2) minimum is required for this tour. Discover the Opera backstage & practice your French with your tutor & professional guide During this tour you will explore a fascinating monument backstage in easy French, taking in account your current level. Accompanied by your French tutor who is also a professional guide, you will discover the architectural treasures of the legendary opera house. 149 Euros for the gourmet tours (a tasting of cheese or pastry is included). Our Paris French conversation tours typically last 2 hours. Longer tours can be arranged, or tours for you and your spouse / your children or a couple of friends for an additional 19 Euros per person (food and museum fees not included) – it’s suggested that you keep the number of participants small so that everybody gets a chance to really interact with the teacher. Unless mentioned on the description, the Paris tours are open to any level of French speakers: our experienced teachers will adapt to your level of French to make the experience fun and productive. All of our teachers also speak English but we prefer keeping the English to a minimum during these immersion tours. The meetup point is usually in a café or pastry shop (or the Rodin museum, or at a precise address for the neighborhood tours…): your French teacher will go over your goals and needs, and start practicing French in a more or less structured way depending on your level and how you’d like the tour to go. For this part of the lesson, the teacher will go over the theme related vocabulary, study useful expressions, and then role play a bit to prepare you to interact with French people. Then, you will all take off for the walking part of the tour. Your teacher will take you to famous stores but also open their private address book to you, and show you off-the-beaten track finds only Parisians know! You’ll experience Paris like a true Parisian. He/she’ll stop wherever you’d like, to browse or to bring something back home. Your teacher will gently encourage you to interact with Parisians in the shops and street of Paris, and will be by your side should you decide to purchase something, helping you and gently guiding you when needed. Have fun, be safe, and practice your French with the warmth and encouragements of an experienced and friendly French teacher. Inquire / Book a Paris Conversation Tour Now! Just to say we had a very enjoyable tour round Montmartre with Marie yesterday. She truly brought the film “Amelie” alive. From being a little apprehensive about trying my French she put me at ease and it was a very positive experience. She was very friendly, helpful and patient. It really added another dimension to our wonderful weekend in Paris and I felt more emboldened to speak French in shops and restaurants. Merci Beaucoup! 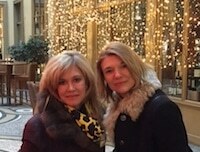 I spent 2 amazing afternoons in Paris with my tutor Florence. What a sweetheart she is, easy to talk to and the history was fun and interesting. I will do this again for sure when I am next in Paris. Florence,Thank you so much for your help with my French and the time spent touring Paris. I think I progressed in two lessons more than I have in a year, and at least feel it’s possible for me to learn and enjoy the language! You thoughtfulness for the areas of my interest in design, the arts, and auctions is appreciated. I am newly motivated to continue with my studies and hope to return soon to continue in person. 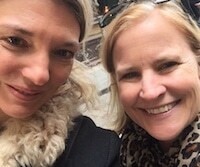 Great lesson with Florence while exploring the beautiful and historic Saint Germain des Près neighborhood. 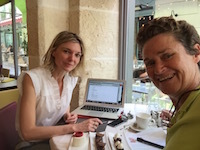 She is an excellent teacher and helped me feel more comfortable speaking French. Merci beaucoup! 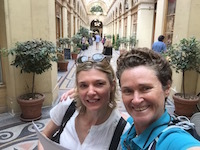 Florence’s French tutoring class was a perfect match for what I was looking for during my one week visit to Paris. My speaking skills needed a quick jump-start since it had been awhile that I’d spoken French. I work in the food industry and enjoy learning all things food and culinary. I set up the pastry and chocolate class with Florence in advance by email. We met for 2 hours in the Saint-Germain-des-Près district of Paris. The lesson started at a patisserie where Florence described the pastries and chocolates on display. Florence then conducted an interesting and well-rounded French lesson teaching various topics such as pastry names and phrases to describe their deliciousness. All of this while enjoying a pastry of course. She highlighted popular pastry chefs starting new trends. 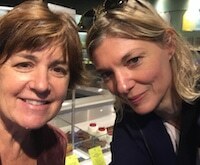 The lesson continued by visiting several prestigious “pâtisseries” and “chocolateries.” Just by going into the shops with Florence, a Paris native, was confidence building as well as fun! After the lesson I felt more determined to speak French for the rest of my stay in Paris, which was exactly what I was hoping for. Florence is friendly, professional, and really wants to help you learn. Your brain will be well-exercised during the entire lesson, and it’s so worth it! Anni – All the French Conversation Tours! 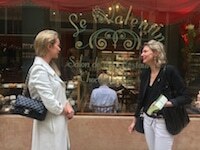 If you want to learn French in Paris but not in a stuffy classroom then I highly recommend these French conversation tours! I worked with Florence for two and a half weeks of intensive two hour immersion sessions. 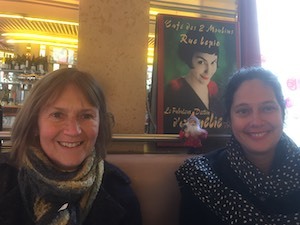 We visited patisseries, markets, les passages couverts and museums, and complemented this with conversational grammar in the calm of a quiet cafe. At each stage Florence paced the learning, was aware of my progress and introduced lessons that took me to the next stage. For me this was the best way of enjoying Paris and enjoying learning French. What a fun, real way to improve your French! 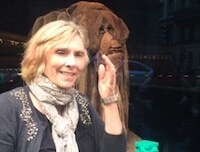 I spent an afternoon with Florence in Paris recently in a session and we discussed in French Chocolat et patisserie. What better way to spend a day? Florence helped me with vocabulary by providing handouts with words, names of and short bios on chocolatiers we were going to visit. 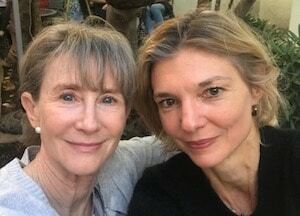 Florence is a kind and generous person and teacher. I will be doing more on my next trip to Paris, bien sûr. I had the most wonderful time with Vanessa. I was very nervous before meeting her but she made me feel very relaxed and comfortable. She spoke to me clearly and allowed me to be able to understand nearly everything that she said. The tours we chose, Parc Monceau and Le Canal St Martin, were excellent and informative. I’d highly recommend Vanessa – and I will to everyone coming to Paris. Je voudrais dire ” merci beaucoup” pour les deux jours avec vous. C’était très agréable et j’ai appris plusieurs renseignements de Paris. Vous étiez une bonne compagnie. J’espère vous voir en Australie l’ouest un de ces jours ! [My French tutor] dusted off my woeful conversational français, then gave me a guided tour of the Left Bank including a visit to the city’s best chocolate shop, Un Dimanche à Paris, and Sartre and Hemingway’s favourite café, Les Deux Magots. There, she insisted I try out my new found skills ordering croque monsieur and melt-in-the-mouth tarte au citron (after a quiet word of warning in the waiter’s ear). I have studied French for many years using various methods. Of all those attempts, my week with Florence was by far the most productive, the most interesting, and certainly the most pleasant. After a few mornings at a cafe, where we focused on grammar and structure, we ventured out into the city. As we strolled through parts of Paris that I’ve never visited, she educated, instructed and amused me. I visited Paris for an extended stay and Florence was a tremendous help to me learning the language. My trip to Versailles with her was not only the best way to spend the day practicing conversational French, but we had a lovely, fun time and it was one of the highlights of my trip because she was such great company! Vanessa was the best part of my trip while I was in Paris. 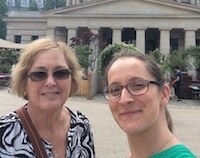 Staying in Paris is already great, but having you as a private French teacher and a guide through places that any tourist would never go to was terrific. After going to Paris so many times, now I really can say that I know the city from a “Parisian” point of view.